In SPECTRE RISING, I wrote an author’s note with a disclaimer that, although I’ve seen and done a lot of cool stuff as a fighter pilot, I didn’t think my life or service interesting enough to warrant an autobiography. As a result, I turned to fiction. I made it clear that the story contained within that book was just that, a fictional story derived wholly from my imagination. But every author pulls inspiration from various places. Some work strictly from their imagination, creating worlds and settings that only the most vivid of imaginations could conjure. Some get their inspiration from news headlines. Still others pull from life experiences, putting their characters through events based on their own lives. The SPECTRE Series is a mix of all three. Hopefully this post offers some insight into a scene that hit very close to home for me. Today marks the two year anniversary of the death of my father. I started writing AVOID. NEGOTIATE. KILL. just a few months after his passing. Writing helped me take my mind off the loss of my best friend, mentor, and idol, but some of that pain also translated into the pages of that book. The following is the story of the day I found out he was gone forever. If you’ve read ANK, you’ll know exactly what chapter I’m referring to. It’s one of few in this series that I have written directly from personal experience. A little backstory before we begin – on October 18th, 2013, my dad had his third back surgery to fix the spinal stenosis he had been struggling with. He was 65 years old and in good health. He had lost a lot of blood during the surgery, but had been released after a week in the hospital. After two weeks, his prognosis seemed good. He was walking and getting around with a lot less pain than he’d had before the surgery. Things were looking good, or so I thought. How do you quantify the worst weekend of your life? Me with my dad – my best friend, idol, and mentor. On the morning of Saturday, November 9th, 2013, I woke up focused on one thing only – getting through a PT test for the Sheriff’s Department Reserve Division that I had recently volunteered for. I was completely oblivious to how drastically my life would change that day as I chatted with my girlfriend on Facebook about whether there might be a “secret set of standards for the PT test” and how she planned on taking her dog to a pet social event that morning. Nothing deep down told me that something was wrong. Nothing seemed out of place. Even when I turned onto the main road in front of my house, nothing seemed wrong when I called Dad’s phone and it rang until it went to voicemail (which he had only recently finally set up). Generally, he always answered on the first or second ring, but the last couple of days he had called me back, saying he had left the phone in the kitchen. I figured this time was no different. He had just left the phone in another room. I still didn’t think anything was wrong as I turned on the on ramp to interstate and it went to voicemail again. As I set the cruise control and settled in for the 20 minute interstate drive, the phone rang. The caller ID in my truck showed my stepmom’s number. I thought maybe he had used her phone or she was calling me to tell me his phone was off, as she sometimes did when he missed my call. We talked on the phone every day – sometimes multiple times. “Hello, Eula,” I said cheerfully. There was a pause on the other end. I still had no idea anything could possibly be wrong. And then she said the words I had dreaded my entire life. “Your daddy’s dead!” she shrieked. She was panicked, nearly screaming. I tried to get information from her. She told me he wasn’t breathing and the ambulance was on the way. I asked her if she was sure. She wasn’t. We hung up. I prayed she was wrong. I turned off at the first off ramp and sped toward the opposite direction on ramp to go back home. Were it not for the center catch fence, I would’ve probably gone across the median and turned around. I didn’t care, I wanted to get the boys and get there as quickly as possible. I called my girlfriend. We might have been having problems, but those didn’t matter anymore. She was still the only person I knew to turn to. She tried to calm me down, I didn’t know what to say. I was in a state of disarray as I passed car after car trying to get home. I hung up with her and called my Aunt, telling her what happened. In the chaos, there’s always false hope. I asked her to tell my cousin. We prayed that there was still hope. I arrived at my house and grabbed my go-bag along with food and essentials for the dogs. We were back on the road within ten minutes and I sped toward my dad’s house in the early hours of the cold November morning. I was wearing PT clothes and had packed nothing but underwear and t-shirts. I didn’t have time to think about funerals. I needed to talk to someone as my heart raced. I called my girlfriend back. What can you say to someone whose world has just shattered? Apparently nothing. She didn’t answer. I called and left a voice mail with my Air Force mentor. It was Saturday morning. People were out doing things. I kept calling people. Finally, an old high school friend answered. We talked. I begged anyone that would listen to pray. I hoped there was a chance. And then the phone rang again. It was Eula’s phone, but a family friend was on the other end. The coroner had pronounced him dead. All hope was gone. She asked if I wanted them to wait for me to get there so I could see him. I said no. There was no way I could see him like that. I got bits and pieces of the story. He had died in his chair as he put his coffee down to check his e-mail at the desktop. It had been quick and painless. At least he had that much. Eventually I realized there was no reason to keep speeding toward a funeral and slowed. More people called. I finally got in touch with my girlfriend for support. She said she had been at a chapel saying a rosary for him. I asked her to be with me. She couldn’t. She had a promo that night and couldn’t get away. I went back to calling people. When I got home, the computer chair had been pulled out and rolled into the dining room. Eula was hysterical. There were people everywhere. I broke down, wishing it were a dream. It wasn’t. We went to the funeral home and waited. And waited. And waited. I stayed outside to get air, still talking to my girlfriend via text and on the phone. I asked her again to be with me. She said she couldn’t. I asked if she planned on breaking up with me before all of that, she said no. I felt so alone. My family couldn’t make it until the next day. My brother’s caretaker (he is 30 and has cerebral palsy, she had worked with us for nearly 23 years and was like family to us) and Eula were just as bad off as I was. When tragedy strikes, you find out who your real friends are and aren’t. My high school friend that answered the phone earlier showed up shortly after we got home. She brought food, and more importantly, friendship. Eula’s family was there. My brother’s caretaker and her family were there. The family friend that had called earlier and her family were there. The house was crowded, but I felt very alone. Dad always had at least three flags flying in the front yard. I put the one on the flagpole down at half mast. A true patriot like my dad deserved the honor. And then the phone calls started. One of the wives from my squadron called just as as my Air Force mentor showed up. I couldn’t believe it. He showed up out of nowhere. A former A-10 pilot, he’s one of those guys that doesn’t do emotions, and when it comes to distractions, that’s exactly what I needed. It was an escape. As the crowds scattered, my high school friend was still there. She took me and the boys to get milkshakes that I didn’t drink. I didn’t eat much after he died. The day prior, I weighed in at 195 after doing two-a-days for two months. By the time I weighed myself again the next week, I was down to 177. But I wanted to see the woman I thought I loved. Or used to love. She could see me after the promo she was doing was over. I thought about driving home. I was going to drive home. To see her. To get clothes. To be held. All I wanted was for someone to hold me. But I was talked out of it. I was in no condition to be driving, they told me. The next day, we went to the funeral home for the wake. I didn’t want to go. I didn’t want it to be real. I didn’t want to see his body. I couldn’t be in the funeral home. I stayed outside. Alone. I had never felt so alone in my life. My brother’s caretaker had her family. My stepmom had hers. I felt like I had no one. I sat in the parking lot and cried. I texted my girlfriend. I’m not a man to beg, but I begged. I begged God for this to be a bad dream. I begged her to be with me. I was denied on both accounts. She couldn’t leave her dog overnight and her family didn’t want her driving that far. My brother’s caretaker came and found me and took me to see the body. It was for my own good. He didn’t look right. I broke down. I was gone. I sat down in the front row pew next to my brother. I wondered how he was taking it. Due to his condition, he has the mentality of an infant. He can walk, but he can’t talk more than baby noises. Sometimes we underestimate how much he understands, but in that moment, I learned he was much stronger than all of us combined. As I sat there, sobbing to myself, my brother reached over to me and grabbed me as best he could. He wrapped his little arm around my neck and pulled me close to him, burying my face into his shoulder. I cried for a minute as he held me there. When I looked back up, he gave me a knowing smile. He understood, and despite everything wrong in the world, he wanted to tell me it was going to be ok. It was the most real gesture of brotherly love he and I had ever shared. Despite all of that, I couldn’t stand to be so close to Dad’s body. I had to get back out. I returned to my solitude in the parking lot. At least I could control that. As I sat on the curb wishing I could just be held, I saw a welcome sight. More friends showed up. It was good to see them. They took my mind off things. They cared. We talked about my crazy girlfriend. Anything to not deal with the pain. Eventually more people showed up. Friends, neighbors, and finally family. My aunt, uncle, and first cousin (despite getting lost and ending up at the wrong funeral home in a different town altogether, but I digress). The loneliness wasn’t as bad anymore. I just had to endure it. We talked about the funeral, and I said I wanted to do the eulogy. I didn’t know if I could, but I thought I owed my dad that much. I felt like that’s what he would have wanted. We got home late that night. I thought about writing a speech, but I collapsed from the lack of sleep and food. I still hadn’t eaten since breakfast the day prior. I was running on empty. The next morning, my girlfriend checked on me. I had been crying in the living room, curled up in the fetal position wishing for death. I asked her if she would be there for me, especially given the eulogy I had to give. She said no. She couldn’t explain, but she just couldn’t. I turned off my phone as my cousin pulled me up and made me quit wishing for death. She took me to go buy clothes. I still had none, and needed something to wear for the funeral. When I returned to my phone, I had a half dozen or so text messages devolving from “are you mad?” to “I was going to come, but since you’re not responding, I guess not.” I apologized and turned my phone back off. I knew it was over. I wasn’t surprised. My entire world was crashing down around me. Why wouldn’t it be? We went back to the funeral home for round two of the wake. More people showed up to tell me how proud he was of me. Every time was like getting punched in the gut. It was a nice gesture, but I still felt like I had let him down. It was good to see old friends there. More friends showed up. People who had my back like my editor, Doug Narby. I finally felt safe. I was still purely ballistic, but I at least knew people were watching my back. I appreciated that. The time came for the funeral. The preacher nodded for me to stand after he said whatever it is preachers say during funerals. I don’t remember much. That was my dad. He had a way of being friendly and joking with everyone he met. It annoyed the crap out of me as an angry teenager, but I appreciated it more as I grew older. He just had a way of disarming people with his sense of humor. After I read the poem, I tried to just talk from the heart. My dad was a man of selflessness. He gave everything for his family. He sacrificed so much to take care of me and my brother. And he did it all without asking for a thing in return. On top of it all, at his core, he was a patriot. He served his country and loved America. He proudly flew the stars and stripes in the yard. And when he learned that I was joining the military, he was so proud. 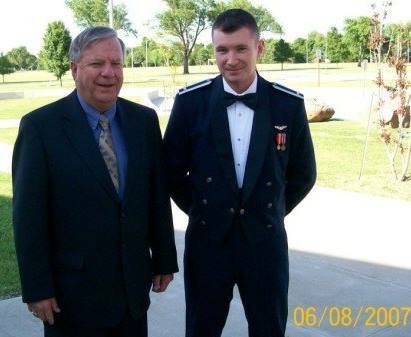 One of the coolest moments in my career was having him at my Officer Training School graduation. 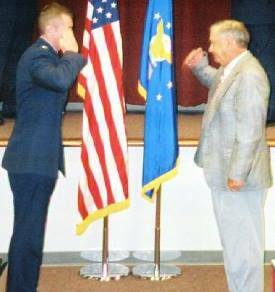 You see, traditionally, enlisted men and women give officers their first salute, but my dad was kind of a special case as former warrant officer so he too could do it. And he did. He kept the “silver dollar” I gave him in his wallet until he died. So at the end of the eulogy, I turned and saluted as best I could, hoping to return the honor he had given me. The funeral ended and we headed to the cemetery. The police officers of the local PD honored my dad, saluting the hearse as we drove by. It meant so much to me to see that kind of respect for a fallen soldier. We finally made it to the cemetery for the burial. The National Guard Honor Guard did a great job in honoring him. Hearing the taps play was soul crushing to me. I had heard it before for friends and that sucked, but never family. My family stuck around after the funeral to give support. They say the worst part of losing someone is not the funeral, but when everyone goes home. I can attest to that. I broke up with my girlfriend the next day. It wasn’t because I wanted to, but because there was no way to fix it. She had abandoned me when I needed her most. That was a bridge that just couldn’t be rebuilt. I later learned that she declared that she was happy to finally be rid of the baggage [me] that had been keeping her down. All’s well that ends well, I guess. Losing a family member is a very painful and personal thing, and so is losing a friend. I wanted to translate to paper what I felt and went through during that very rough time in my life. Unfortunately that meant Spectre had to live it too, but I think it made him a stronger, more dynamic character for it. What did you think of the funeral chapter in AVOID. NEGOTIATE. KILL.? Leave your opinions in the comments section. Whew! That was powerful CW, it gave me a lump in the throat and misted my eyes. There is no easy way to lose a mother or father or anyone close. You have and continue to live a fascinating life. You have been gifted with a very rare talent of communicating from your mind and heart the essence of what we all feel. Your writing is a catharsis for your soul, and you do it so well. Thank you!